Search analytics provider Searchmetrics spent the weekend examining the effects of last week’s changes to the Google algorithm – changes that Google said would affect around one in three Web searches. According the company’s initial analysis, sites with fresher, more-up-to-date content, including many news sites, blogs, broadcasters and brand sites, have indeed seen a boost from the update, as Google promised. This includes sites like TechCrunch parent The Huffington Post, Salon.com, the U.K.’s Daily Mail, plus a number of blogs, celebrity news sites and a large list of brands. However, the sites that lost SEO visibility after the changes didn’t seem to represent any one group, as they also included some brands, blogs, broadcasters and even Google’s own Blogger.com, which dropped over 20%. Google’s most recent algorithm update was announced last week as an extension of its previous “Caffeine” update. The so-called “freshness update,” as it’s called, aims deliver more current and relevant search results, specifically in areas where the most recent content matters. This includes things like current events, hot topics, reviews and breaking news items. To determine how various websites were affected, Searchmetrics performed its analysis using its own SEO database, which ranks sites using its “SEO Visibility” metric. This metric is based on the search volume of a keyword, the type of search (informational, navigational or transactional) and the rank of the URL in question. 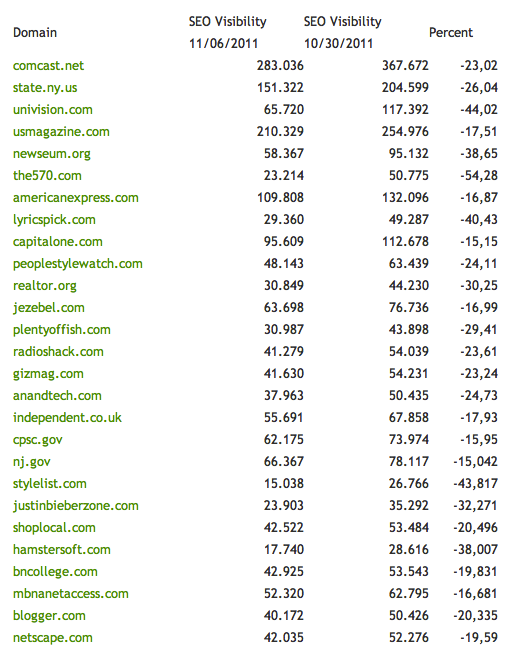 In the initial list of winners and losers (see below), Searchmetrics provides the previous SEO Visibility for the sites as of October 30th and the current rank as of November 6th. The percent change is also indicated on the far right, while the type of site is on the far left. The full list is also available on the Searchmetrics blog, where you can click through on the individual URLs to see the changes in more detail. Searchmetrics’s software is available here.